There’s just something about sour cream mixed into a cake batter. The added moisture and texture makes it so…so…so fluff-ilicious! 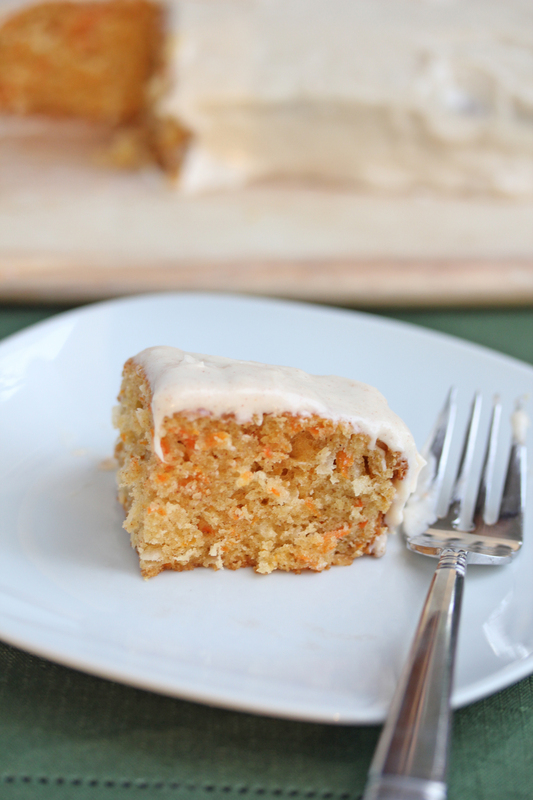 And then the frosting…sneaking in a little Breakstone’s sour cream into this cake’s frosting for a perfect balance of sweet and tangy with every bite. This cake is the perfect end to any holiday meal…it’s light, tasty and will satisfy your palette without making you feel overly stuffed after your feast! Preheat oven to 350. Grease 2 9” round cake plates with non-stick cooking spray and flour. In a mixing bowl or stand mixer, beat together the eggs, oil, and sour cream until creamy. Beat in the sugar until smooth. Add the cake flour, baking soda, baking powder, cinnamon, ginger and salt. Beat for 2 to 3 minutes, or until smooth batter forms. Fold in the shredded coconut and grated carrots. Pour the batter into the prepared baking dish. Bake for 30 to 35 minutes, or until toothpick comes out clean. Let cool for 10 minutes on a cooling rack before removing the cake and placing on the serving platter. To remove the cake, gently loosen the edges with a knife. Flip it onto a flat baking sheet, then flip it back right side up onto the serving platter. Let cool for at least an hour before frosting. To make the frosting, beat the softened butter, sour cream and cream cheese with the vanilla until smooth. Add the cinnamon, ginger and 1 cup of the powdered sugar. Beat until smooth. Add the last cup of powdered sugar and beat until thick and creamy. Place the frosting in the refrigerator until the cake is cooled and ready to be frosted. 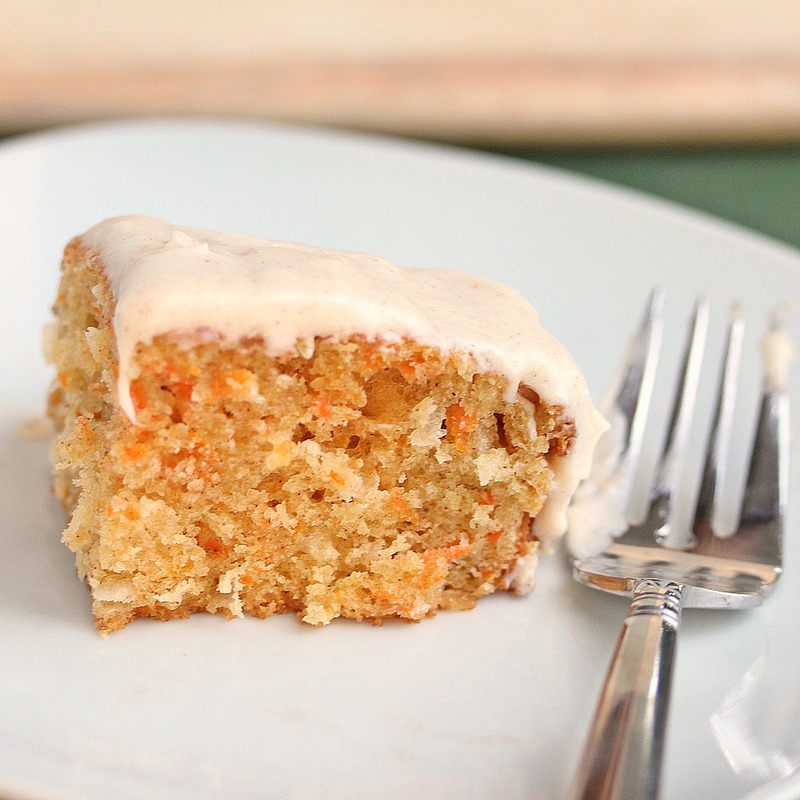 Place the cooled cake on the serving dish of your choice, then frost the top and sides of the carrot cake. Sprinkle shredded coconut over the tops and sides of the cake. Sounds delicious–but your links to vote don’t seem to be working! Thanks Megan…the links have been updated!